"This was a great team building event! I have participated in several, but this was by far the best." Charlotte’s growth and success will permeate your next corporate training or team building. With hundreds of Fortune 500 companies and a banking center second only to New York City, the Queen City’s Southern hospitality accommodates newcomers with edgy restaurants and tasteful shopping centers from Trade Street to Ballantyne. Amidst the giant oaks shading Charlotte, we blend Low and High Ropes Course challenges ranging from 5 to 35 feet high and individual to team level experiential learning opportunities. Whether you’re balancing the entire team on a giant teeter totter on the ground or across a high wire up in the air, you’ll develop leadership, communication, problem-solving, and coaching skills. No low challenge is possible to complete on your own; call on every member of the team to communicate, generate ideas and provide support as you transport the entire team up and over a wall. 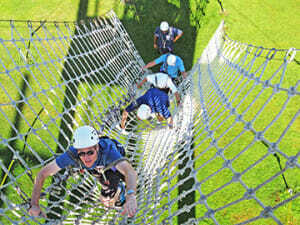 The High Ropes Course emphasizes risk-taking, trust, and coaching. Check out the view of the treetops before you ride the zipline back down to ground level. The challenges allow participants to expand their comfort zones—sometimes dramatically—and recognize fears that may block personal achievement. The ropes course memories and moments carry over to the work environment for a long time. Integrate philanthropy and fun into your next team building event with our Golf for Goodness Sake program at Freedom Park or in the conference rooms at the Ballantyne Hotel & Lodge. Small teams construct a mini-golf course out of non-perishable food items and compete in a Tournament round before donating items to a local Food Bank. Combine this team building experience with our powerful Emissary Process as a way to provide interdepartmental feedback and ultimately improve the whole company.